"Successful brand structure and promotion are key to market success"
"The annual import volume of fruit into China has been around 4 million tons in the last 3 years. The average annual fruit import value was around 5.5 billion USD. This volume, however, only accounts for 3%-5% of the volume in China's fruit market. There is still great potential for imported fruit in the Chinese market, and in high-end markets in particular. There are several reasons for this situation. First, the disposable income of Chinese consumers continues to increase every day, as does their awareness of healthy foods. Second, China takes advantage of great trade relations with numerous countries to open the doors wide to a variety of imported fruits. Of course, the world economy suffered from fluctuations caused by a number of factors. This could have its short-term effects on the Chinese market, but I think that it will not have any lasting, structural influence." This is according to Li Liang of Joy Wing Mau Group. "The two greatest influencing factors in the competitive fruit trade are price and brand. The continuous increase in living standards in China mean that some previously high-end, expensive fruits have become relatively common products. Take for example Red Globe grapes or Royal Gala apples. Some other fruits, however, are new in the market. Their novelty attracts the attention of consumers and wins their praise. These new fruits are in a luxurious position of high-quality, expensive fruits. This is the case, for example, for domestic Shine Muscat green grapes, imported Muscat grapes, and Rockit apples." "Apart from this, branding has become one of the most important ways for consumers to recognize various fruits in the past few years. Several larger trading companies have recognized this development and stepped up the pace of branding in the fruit industry. Zespri kiwifruit, for example, has become the first choice for many consumers looking for kiwifruit. Envy established its name as one of the high-quality apple brands. 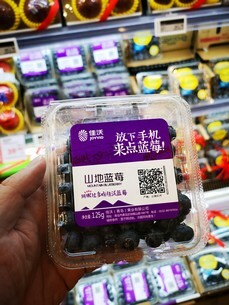 Joyvio has established a similarly effective brand for high-quality blueberries. 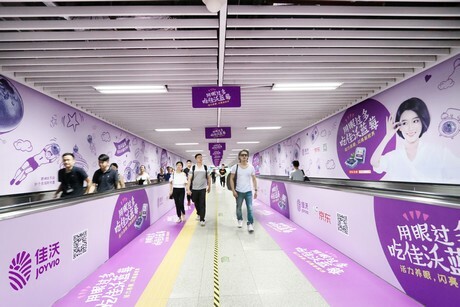 It is particularly important in the multi-layered fruit market of China to establish a unique brand and carry out effective promotional activities. Joy Wing Mau spent many years of industrious effort in the construction of brand structure and brand promotion. They achieved great results in today's fruit market." "One expression that vividly describes the Chinese economy is that 'Chinese economy is not a small pond, but an ocean.' Although China's fruit trade has felt the effects of the Sino-US trade war in recent years, the overall fruit consumption in China continues unchanged. Consumers still demand high-quality fruit, especially consumers from the rapidly growing middle-class. People have growing standards for healthy food. We are more than optimistic about the future of the fruit import and export industry in China. Joy Wing Mau Group will continue to work hard for the integration of global fruit production core areas and the vast Chinese consumer market. We will bring high-quality fruit from all over the world, and simultaneously promote great Chinese fruit abroad."